Search results for "Rogers Partners Architects+Urban Designers"
Kazakhstan (New) Commissioners: Minister Muhamediuly Arystanbek. No Man’s land Commissioners: Ivanka Apostolova. Curator: Stojan Pavleski. Exhibitors: Stojan Paveski, Ivan Simeonov, Gjorgji Radovanovic e Ljupcho Tasevski. Nigeria (New) ‘Diminished Capacity’ Commissioners: Nkanta George Ufot (Ministry of Information and Culture). 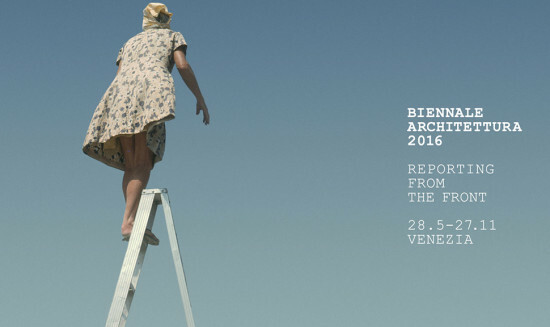 Curator: Camilla Boemio. Exhibitor: Ola-Dele Kuku. Seychelles (New) Commissioners: Benjamin Rose. Curator: Andres Ramirez. From the architects: "Remembering the fallen Twin Towers through their surviving physical structural footprints, the 9/11 Memorial Museum stands witness to the tragedy and its impact." From the architects: "The new building for the Faculty of Architecture, Building and Planning responds to the urban design values identi- fi ed in the Campus Master Plan and enhances the existing open spaces within the historic core of the Centre Precinct of the Parkville Campus. 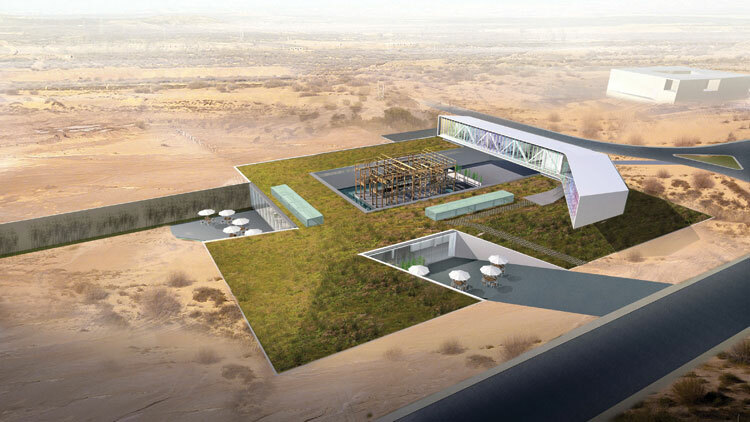 It engages with the existing landscape elements, continues the sequence of outdoor rooms arrayed across the campus, and links strongly to the intricate network of circulation routes that surround the site. The new building compliments and enhances the sense of place that the Eastern Precinct of the Parkville Campus already commands." 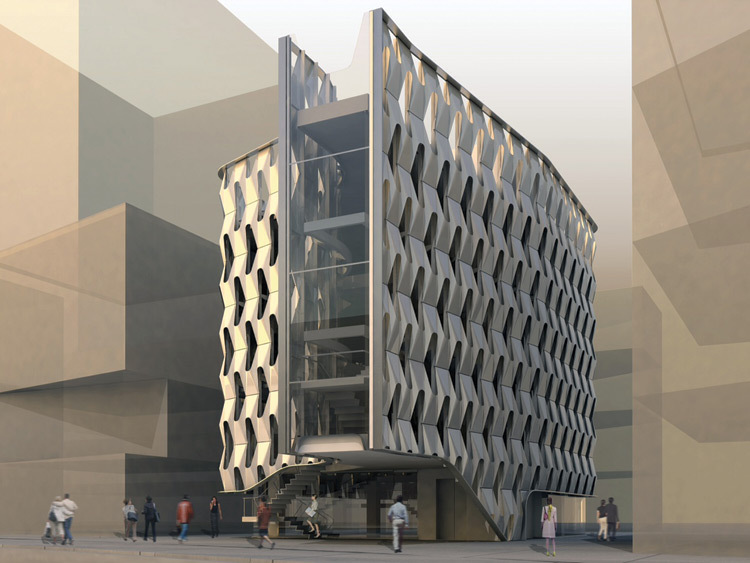 From the architects: "Turkey’s pre-eminent fashion house, Vakko, and Turkey’s equivalent of MTV, Power Media, planned to design and construct a new headquarters in an extremely tight schedule using an unfinished, abandoned hotel. Fortuitously, the unfinished building had the same plan dimension, floor-to-floor height, and servicing concept as another one of our projects, the Annenberg Center’s 'Ring', which had been cancelled. By adapting the construction documents produced for that project to the abandoned concrete hotel skeleton, construction on the perimeter office block commenced only four days after Vakko/Power first approached our team. This adaptive re-use opened a six-week window during which the more unique portions of the program could be designed simultaneous to construction." From the architects: "The new Elmer A. Henderson: A Johns Hopkins Partnership School and The Harry And Jeanette Weinberg Early Childhood Center, together called Henderson Hopkins, is the fi rst new Baltimore public school built in 30 years. A cornerstone for the largest redevelopment project in Baltimore, it is envisioned as a catalyst in the revitalization of East Baltimore. The seven-acre campus will house 540 K-8 students and 175 pre-school children." 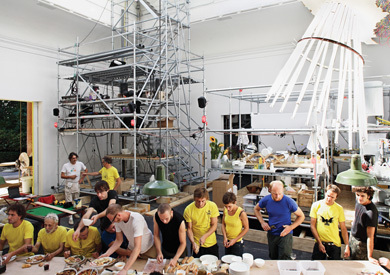 From the architects: "A botanic garden is an unusual kind of museum: a fragile collection constantly in flux. As a constructed natural environment, it is dependent on man-made infrastructures to thrive. New York City’s Brooklyn Botanic Garden contains a wide variety of landscapes organized into discrete settings such as the Japanese Garden, the Cherry Esplanade, the Osborne Garden, the Overlook, and the Cranford Rose Garden. The Botanic Garden exists as an oasis in the city, visually separated from the neighborhood by elevated berms and trees." From the architects: "The newly-opened Krishna P. Singh Center for Nanotechnology demonstrates the University of Pennsylvania’s leadership in the emerging field of nanotechnology. Nanoscale research is at the core of cutting-edge breakthroughs that transcend disciplinary boundaries of engineering, medicine, and the sciences. The new Center for Nanotechnology contains a rigorous collection of advanced labs, woven together by collaborative public spaces that enable interaction between different fields. The University’s first cross disciplinary building, the Singh Center encourages the exchange and integration of knowledge that characterizes the study of this emerging field and combines the resources of both engineering and the sciences." Sited beside a light rail line, this project will be Houston's first transit-oriented development. As Houston begins to grow from the inside out, many developers are staking their ground in the Mid-Main district just south of downtown. 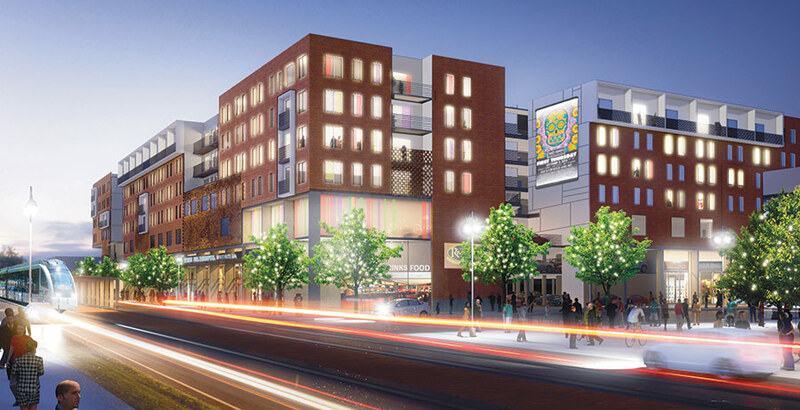 Cultivating a culture of vibrancy, public transit, and neighborhood interaction are some of the goals of one new project located in this prime location along the METRORail light rail system. New York City–based Rogers Partners Architects + Urban Designers and local developer RHS Interests are planning to break ground in Spring 2014 on a mixed-use development located at the 3500 and 3600 block of Main Street. The privately funded project, which also enlists the help of architect and Rice professor William T. Cannady and Gensler Houston, is estimated to be complete by mid to late 2015. Banking on the strengths of the location and seeking to attract younger tenants, the project includes 30,000 square feet of retail space on the ground floor, while 363 studio, one-bedroom, and two-bedroom units fill out the levels above. The development team expects to lure students and young professionals who work in downtown or at the Texas Medical Center—both of which are accessible by the light rail—as well people who are tired of commuting from outlying areas of the city. The structure is complemented with three levels of parking, two of which are shared with the public and one that is dedicated to residents. The apartment block is broken up to create a community courtyard that opens to Main Street. Rogers Partners’ design embraces the urban surroundings by opening the project’s central courtyard to the street. Activity on Main—whether it be passing vehicular traffic or pedestrians visiting the surrounding businesses—will be visible to residents, while passersby on the street will be able to see what is going on in the community spaces of the multi-level development. This permeability with the surrounding environment seeks to imbue the project with the excitement generated by Mid-Main’s many bars, restaurants, and retail shops, including such nearby Houston nightlife institutions as the Continental Club and Shoeshine Charley’s Big Top Lounge. 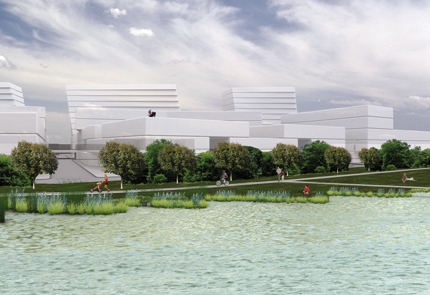 In addition, the development is neighbor to MATCH, a forthcoming performing and visual arts center that will be home to some of Houston’s leading and emerging arts organizations. The urban lifestyle is fostered inside the development through the communal courtyard area. The apartment blocks are broken apart to create this open space and to avoid long hallways on the interior, encouraging socialization among neighbors as well as interaction between retailers on the terrace level. A majority of units have balconies, while the street-side penthouse apartments cantilever out to cap the elevation. 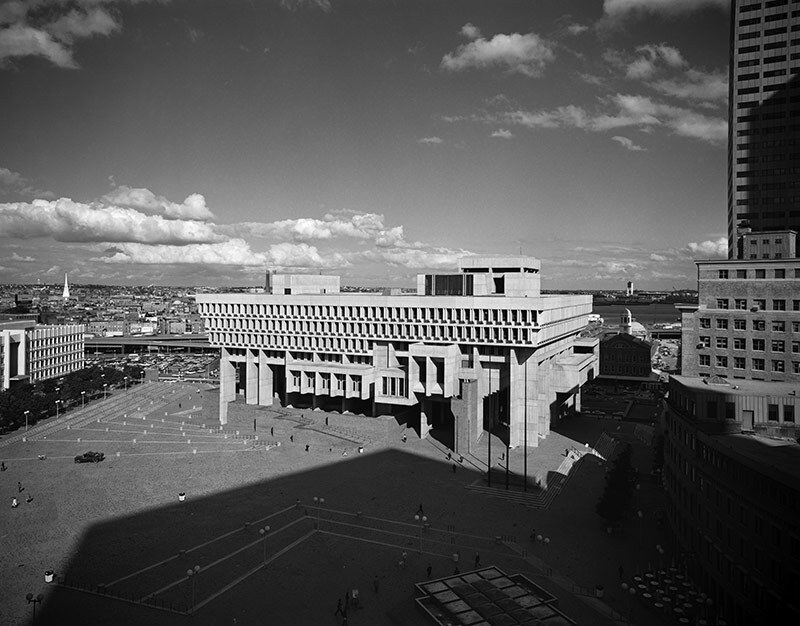 Boston City Hall's vast plaza. Inserting a work of contemporary landscape architecture into the context of a mid-century modernist complex is a challenging proposition. Many of the most prominent plazas, pocket parks, and courtyards from the modernist era feature stark and austere designs that were intended to complement the buildings they were built to serve. Certainly the sensibility of the typical mid-century modernist urban landscape is at odds with contemporary tastes and activities. The greenery was designed to be sparse and ordered. Restrooms, cafes, and shade structures are nowhere to be found. Nowadays, however, urban open spaces are designed for people to linger. The reigning design approach calls for populated plazas, a variety of seating options, cafes, shade trees, and lawns where people can relax. Indeed, many public plazas from the modernist era, such as Dan Kiley’s North Court at Lincoln Center in New York City and Lawrence Halprin’s Skyline Park in Denver, Colorado, have been redesigned to conform to the contemporary program. And although nobody has proposed inserting a lawn and trees into the Seagram Building Plaza, some say that the current open space redesign juggernaut is threatening to eradicate an important part of the country’s architectural history. “We have a thing now about using every square inch, which is not an awful idea, but it might not always be necessary,” said Frank Sanchis, program director of United States Programs at the World Monuments Fund. 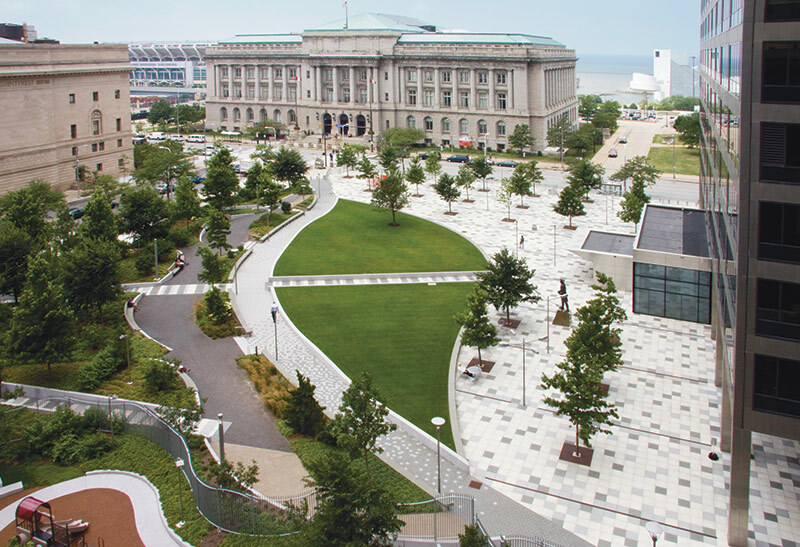 OLIN's redesign of Anthony J. Celebrezze Federal Building Plaza in Cleveland. 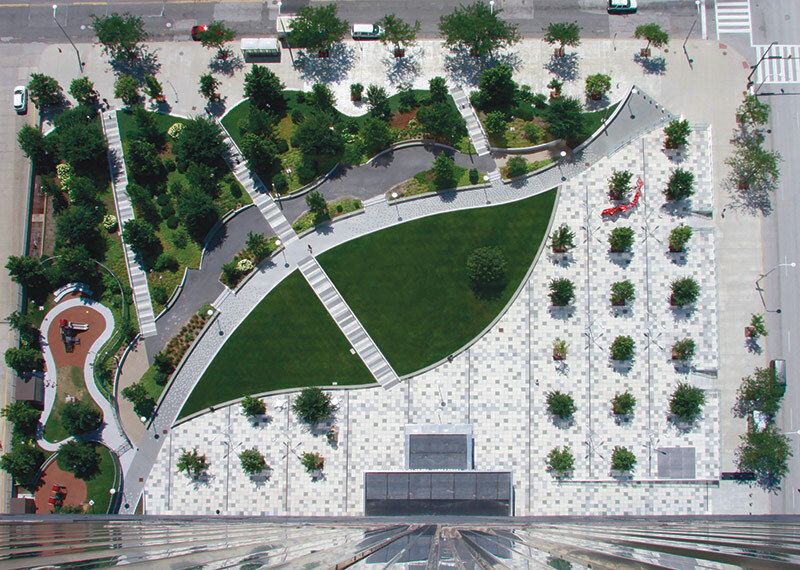 In 2004, when Sanchis was vice-president of New York City’s Municipal Art Society, he helped organize a high-profile competition for the redesign of a dilapidated one-acre elevated plaza at 55 Water Street in lower Manhattan; the plaza originally was designed in the early 1970s by landscape architecture firm M. Paul Friedberg & Associates. The winners of the competition, Rogers Marvel Architects and Ken Smith Landscape Architect, completely redesigned the place with an artificial lawn and a diverse selection of plantings. 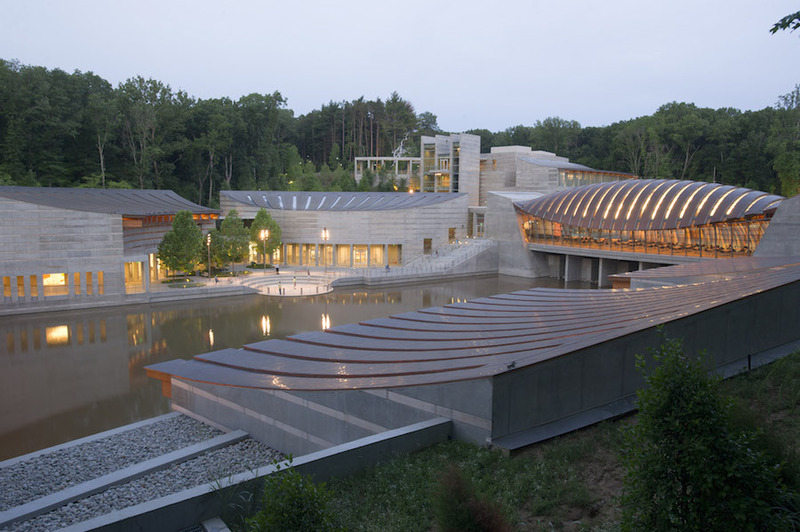 Much of the credit for the reawakening of interest in the preservation of modernist landscape architecture can be tied to Charles Birnbaum, president of the Cultural Landscape Foundation (TCLF). In 2008, TCLF came out with a Marvels of Modernism list to call attention to dozens of significant post-war landscapes that had been allowed to fall into disrepair and were threatened with destruction. Many New Yorkers were introduced to the thorny issues surrounding the preservation of works of modernist landscape architecture several years ago, when a controversy erupted over the renovation of the North Court at Lincoln Center. The North Court was considered a masterwork by renowned landscape architect Dan Kiley. This outdoor temple, situated in front of Eero Saarinen’s Vivian Beaumont Theater, was once one of the most serene sites in the city. 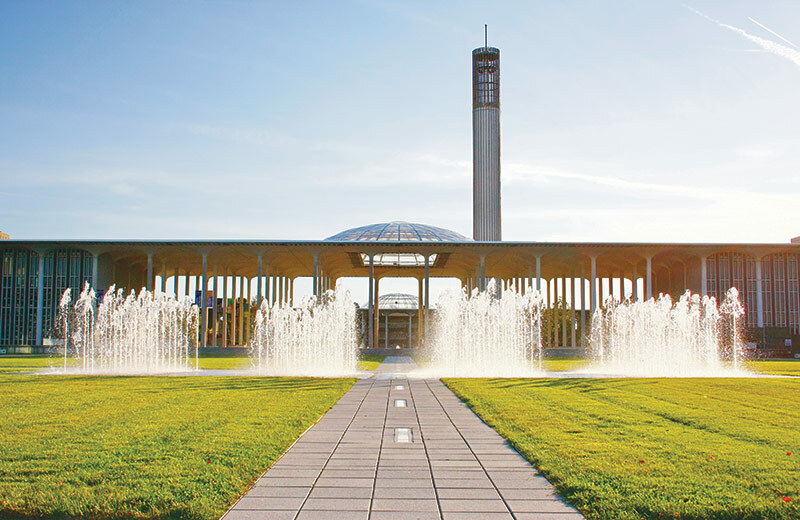 It was a geometrically-ordered place that featured half a dozen benches surrounding a shallow reflecting pool that contained sculptor Henry Moore’s Reclining Figure. The landscape’s geometry complemented the surrounding exteriors of Wallace Harrison’s Metropolitan Opera Building and Max Abramovitz’s Avery Fisher Hall. Although aspects of Kiley’s design remain, thanks to a redesign by Diller Scofidio + Renfro, today it is an altogether different setting. The size of the reflecting pool has been reduced and the distinctive travertine planters removed. In keeping with the contemporary agenda of activating urban spaces, the court is bounded by a restaurant that features a sloping green lawn on its roof where people can sunbathe in the summer. 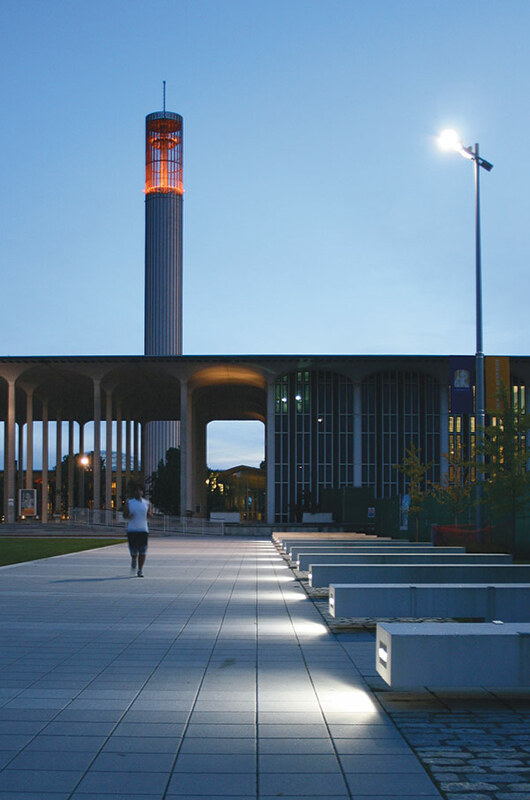 A new quad at SUNY Albany by Thomas Balsley Associates. The design community is still divided over whether Kiley’s design for the North Court could have been updated in such a way as to appease the preservationists and accommodate Lincoln Center’s programming. However, the conditions at other modernist-era plazas certainly call for substantial overhauls. One example is the Anthony J. Celebrezze Federal Building Plaza in Cleveland, originally designed in the 1960s atop an underground parking garage. For more than four decades, the place was an elevated windswept plaza that did not connect with the rest of the city and was largely devoid of human activity. 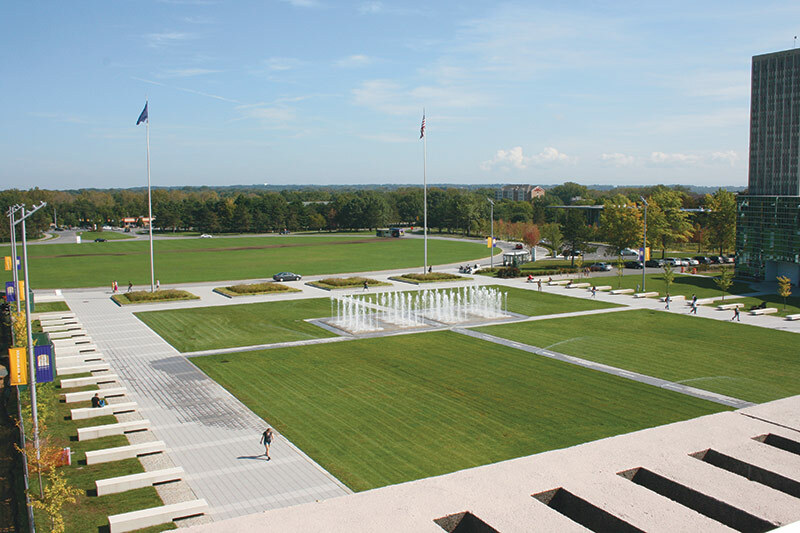 The plaza was comprised of geometrically-ordered planes of grass interspersed with paving. Most of the design intent was oriented toward complementing the 32-story office building that it serves. As happens with many modernist plazas built atop garages, this one developed severe drainage problems. 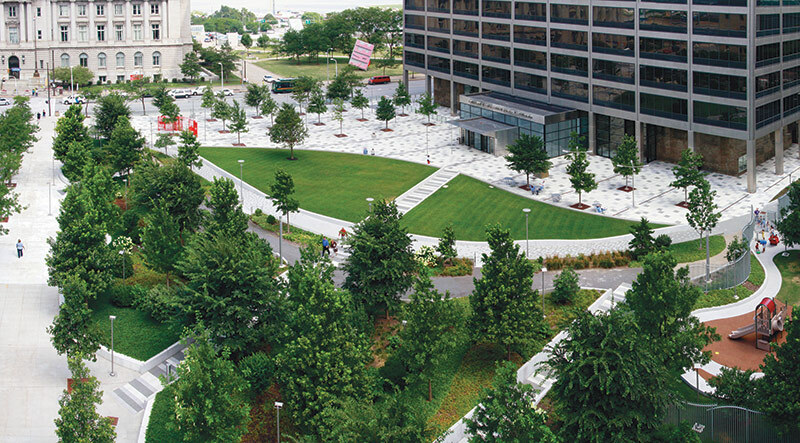 A 2004 renovation by the landscape architecture firm OLIN fixed the leaks and used the opportunity to better connect the plaza with the rest of the city. The architects made the plaza more comfortable, with bosques of trees and grading that help block the 30-mile-per-hour winds that frequently assault the place. Rather than eradicate the plaza’s original composition, the designers incorporated it into a new, sinuous landscape that they laid on top of the old one. 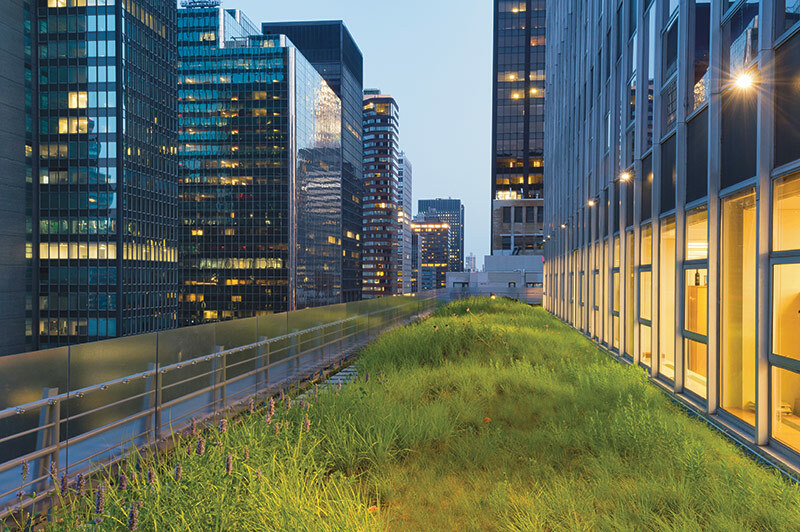 A prairie-inspired green roof in Midtown Manhattan by HM White Site Architects. Private developers are also using contemporary landscape strategies to add value to midcentury properties. 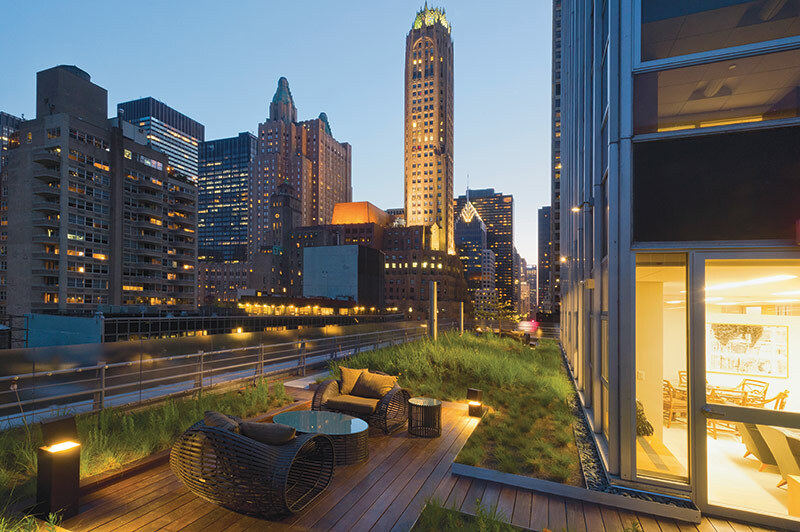 Shorenstein Properties asked HM White Site Architects to create a new outdoor space on top of a setback at the 17th floor of 850 Third Avenue, a 1960s-era Emery Roth office building, which would serve as small meeting areas as well as a pleasant view for the interior offices. 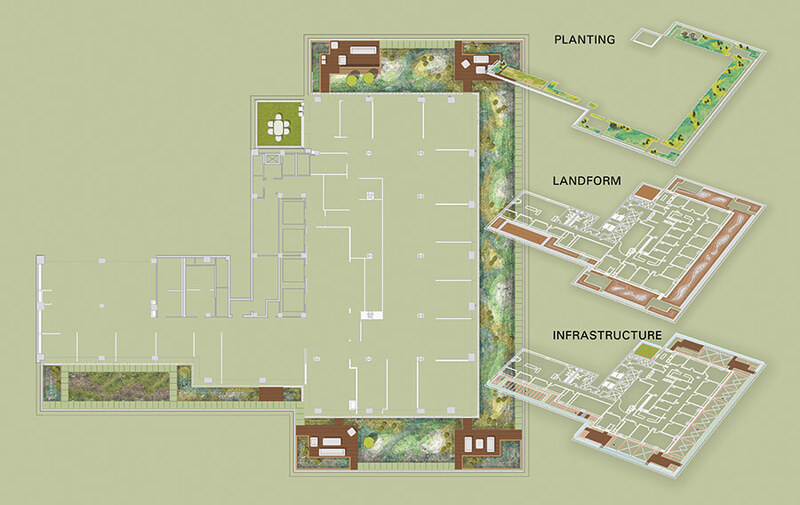 The landscape architects designed a false topography of native grasses and wildflowers, which is visible to most of the workers on the floor. “It creates a natural presence on the building that is a strong contrast to the midcentury architecture,” said Aaron Booher, an associate principal at HM White. Boston City Hall Plaza reflects an approach to urban planning that is antithetical to contemporary notions of what a city’s center is supposed to look like. The 11-acre expanse of brick and concrete was designed in the 1960s as part of a 60-acre urban renewal scheme that centralized many of Boston’s federal, state, and city buildings into Government Center, a massive Brutalist complex of buildings. Some older residents resent Government Center because of what it replaced: a lively, although dilapidated hub known as Scollay Square. The place once bustled with commercial activity and was distinguished by grand theaters dating from the early nineteenth century. But by the 1950s the place had become a bar-crawling nightlife district, and instead of Shakespeare, the theaters featured striptease acts and slapstick vaudeville shows. 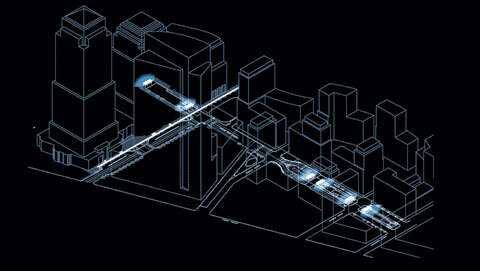 The master plan for Government Center—by I.M. Pei—succeeded in getting rid of the riffraff. But the Brutalist-style buildings and the plaza’s severe design, which was modeled after the Piazza del Campo in Sienna, Italy, also succeeded in getting rid of everyone else. Today, unless one has business at one of the government buildings on the plaza or there is an event, such as the farmer’s market that moves in twice a week, there is little reason to linger there. This windswept expanse is largely devoid of greenery. There are no shade structures and no seating. When it rains, the plaza’s inadequate drainage system overflows, leaving large puddles throughout. And traversing the plaza’s 26-foot grade change involves negotiating innumerable staircases. 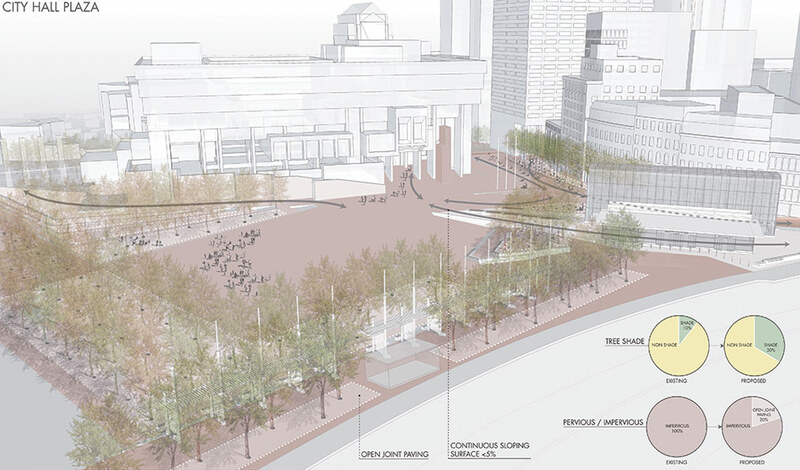 The proposed alterations to Boston City Hall Plaza by Utile and Reed Hilderbrand. It now appears that a more viable plan is on the table courtesy of Greening America’s Capitals, a new federal initiative that is a joint program of the EPA-HUD-DOT Partnership for Sustainable Communities. The initiative led to a plan designed by Utile, Reed Hilderband, Durand & Anastas Environmental Strategies, and Nitsch Engineering. 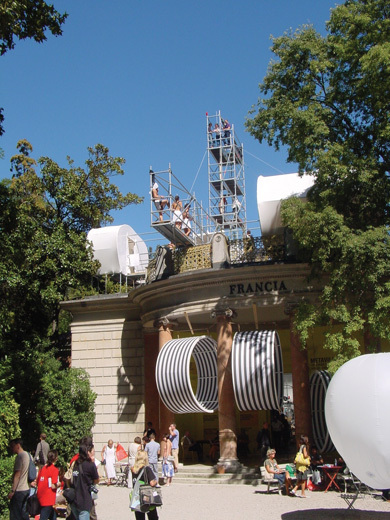 The plan is oriented toward mitigating the harsh manmade conditions of the plaza with many of the landscape strategies that society has come to demand from contemporary public spaces. The proposed plan features bosques of trees discretely placed to provide summer shade and reduce the heat-island effect. It also improves pedestrian and bicycle access by providing grade changes in places to replace some of the many staircases. 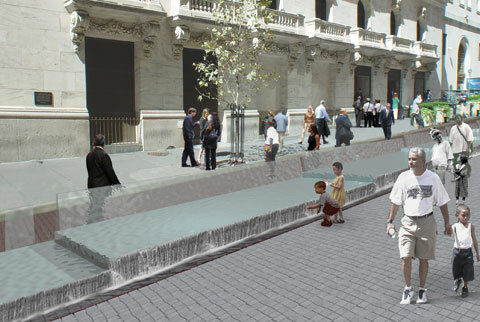 In addition, the plan calls for replacing the plaza’s decrepit drainage system with a modern one that captures stormwater runoff and keeps it on site, instead of allowing it to run into the harbor. One of the most important aspects of the team’s vision for City Hall Plaza is that, “it is a plan for adaptation, not a redesign,” said Hilderbrand. The design embraces the plaza’s Brutalist aesthetic by preserving its vast expanse of bricks. In fact, although the plan calls for new bosques of trees at grade level, thanks to structural soils, there will be no tree grates. The bricks will come right up to the trunks of the trees. 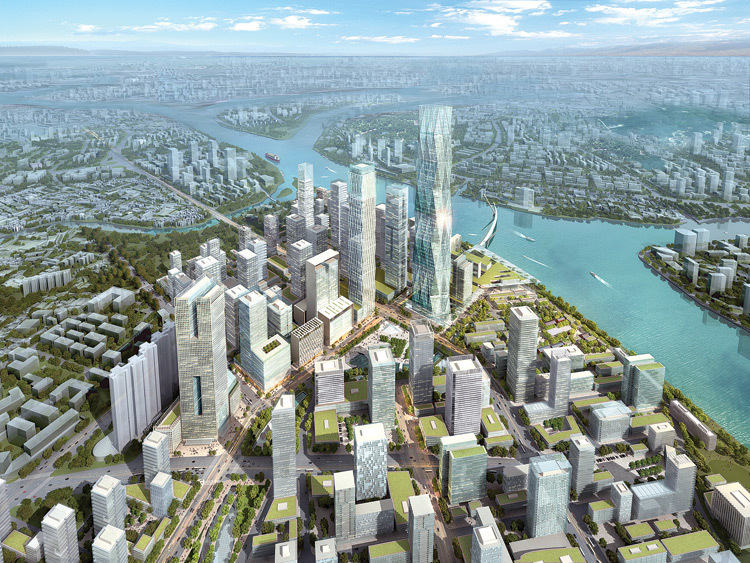 Given the cooling of its once red-hot economy, is China the right place for western architects? Do ambitious firms have a choice? The United States has been nearly paralyzed by the foreclosure crisis and two major wars. The euro has been showing signs that it may collapse. Brazil has been faltering. The once breakneck pace of development in the Middle East has significantly fallen off. With its strong bureaucracy and centrally controlled market economy—somehow not a contradiction—China still beckons, despite these known risks. But whether or not China is the right place for architects depends upon whom you ask. 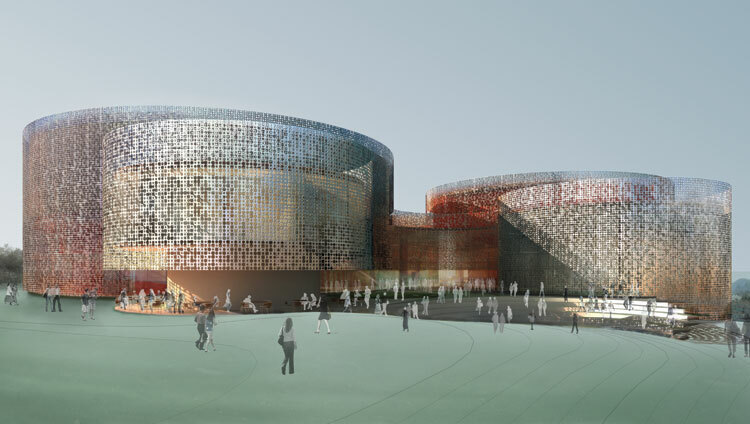 Reality and rendering of Yazdani Studio of Cannon Design’s theater in Ordos, Inner Mongolia..
Once thing is certain: China is not an easy place in which to work. Since the 1980s foreign architects have traveled there, wide-eyed and full of optimism, to realize projects they generally would be unable to do in their home countries. 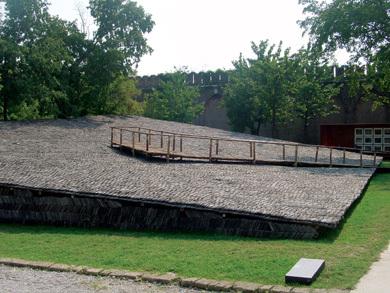 Recalling the empire-spreading colonials of the past, some architects seem to do quite well at taking on China. 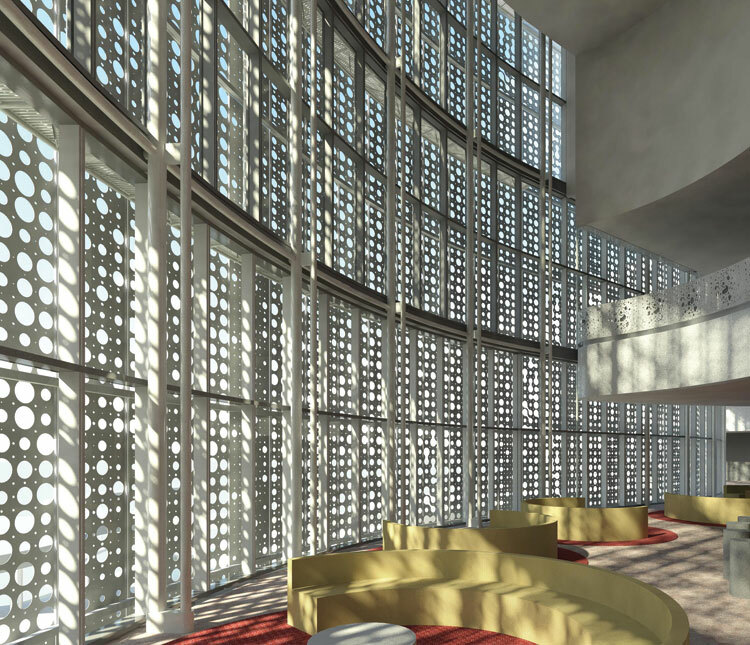 Steven Holl, for example, has built some of his fantastic watercolor sketches. 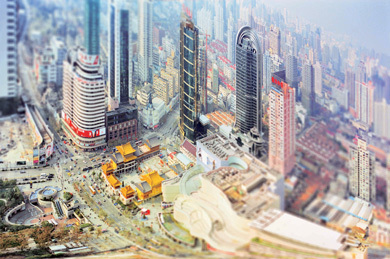 Chinese developers and government officials (often one and the same) seem willing to let OMA do whatever it wants. Young architects just a few years out of internships, like Beijing-based MAD’s Ma Yansong, have landed huge commissions, including iconic high rises, while their counterparts in the U.S. are lucky to receive jobs designing a downtown loft renovation. One presenter summed it up by declaring, “China is about time, process, and metaphors. There is no time, no process, and everything is about the metaphor.” Like many, the speaker, who did not wish to be identified because he would like to continue working in China, is still trying to make sense of his China experience. 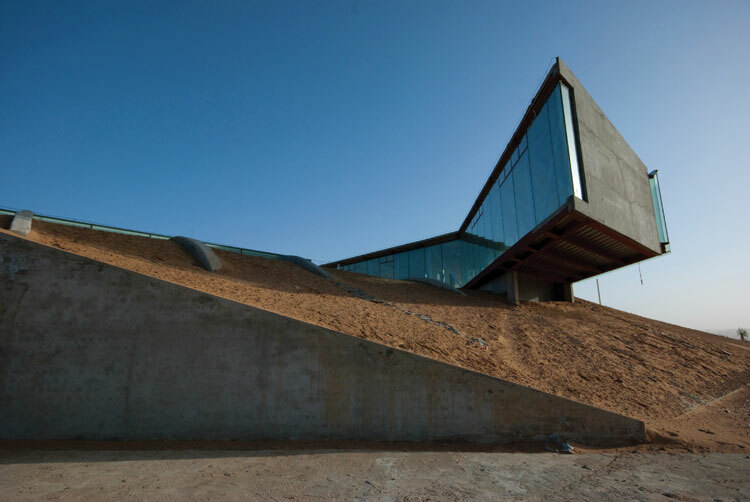 Yazdani Studio’s restaurant is nearing completion in Ordos. To get to the truth about the horror stories from China is not easy—even at an open-bar Pecha Kucha. Speculation and vague rumors are rife. Have you heard that so-and-so had a project built from renderings? Did you know that so-and-so had his designs stolen and he might need to close his office? Did you hear about the firm that lost the competition only to have their idea built elsewhere? Did you hear about the competition that was cancelled after all the submissions were handed in? These are the sorts of unspoken stories that go into The Wince. Yet the fundamental drive to work in China remains, despite the risks. And architects are developing different ways to navigate these complexities with business savvy. rendering of the restaurant reveals the blank slate that is still Ordos (left). A detail of the restaurant's cantilever (right). Denari, it appears, manages the risks by saying no. 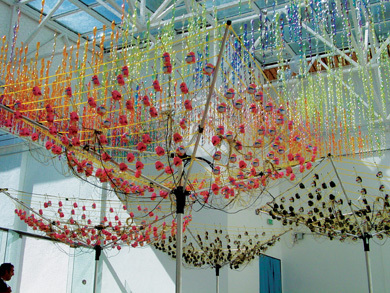 Then there is Alvin Huang, a young Los Angeles architect. For him the China market has been a place to dive in and start building a reputation for his LA firm, Synthesis Design + Architecture. 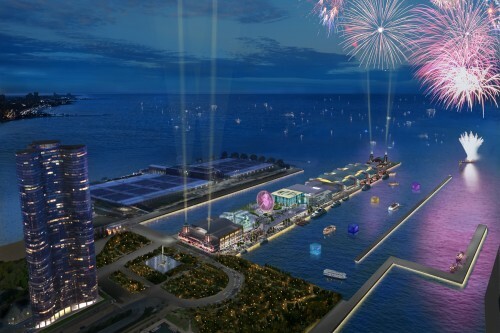 Huang, a Chinese American, started with an unbuilt project that led to a commission for a beach resort in Quanzhou. Everything seemed to be going according to plan until he noticed that the clients kept coming back for more and more changes and development beyond the concept deadline. 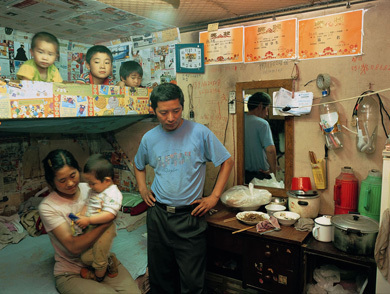 “It’s not a horror story, yet, and I hope it doesn’t turn into one,” Mr. Huang said. “I was trying to be cooperative, but at some point I just had to let them know we weren’t doing any more work.” There was “radio silence” for weeks. Mr. Huang started contacting other people to see if they could find out what was going on. “It’s not like I could go over and pull a Tony Soprano,” he said, noting that there is little opportunity for recourse, even with a contract. Finally the client emailed to apologize for the delay in payment, promising to move forward. From his prior experience he was used to delays, but he had never had someone simply disappear. If the project does go to the next phase, he said he’s going to require 50 percent of the fee in advance. “This isn’t a loss yet, but it’s definitely a learning experience,” he said. 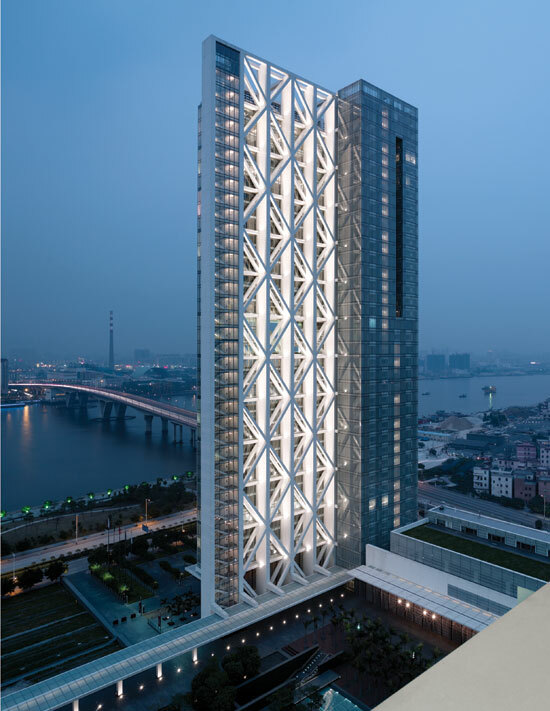 SOM’s Poly Real Estate headquarters in Guangzhou. “You can count on them to take the shirt off your back,” said William H. Fain, Jr., partner and director of urban design and planning at Johnson Fain in Los Angeles. “They have a ‘take no prisoners’ attitude when it comes to business.” He’s speaking from fourteen years of engagement with China, a journey that began when his firm was asked to develop the master plan for Beijing’s Central Business District in 1998. 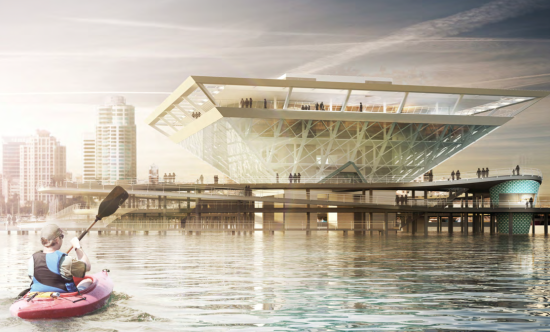 OMA’s CCTV and other high-profile projects now sit within the plan. SOM’s ICBC headquarters in Beijing (left). 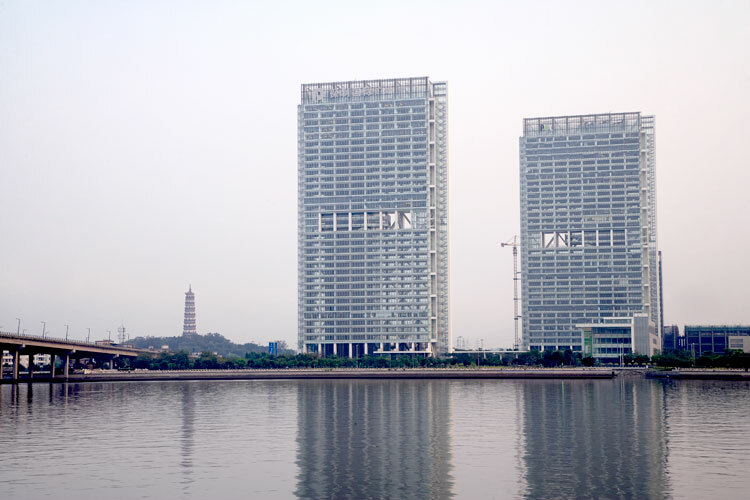 Neil Denari’s unbuilt commercial building in Ningbo (right). Indeed in the popular imagination of the West there exists the tendency to define China as catching up, as being part of the developing world. In the recent past, China has often been cast as inferior, especially when it comes to such so-called borrowed forms of culture as capitalism and even modernity. Such false historical assumptions can factor in to why some firms lose their China campaigns early on. It is easy to get burned if preparations were not thorough. Or if they underestimate the complexity and sophistication of their Chinese counterparts. “Parachute architects.” That is what Michael Tunkey, who opened Cannon Design’s Shanghai office in 2007, calls architects who just drop in without preparation. These are the ambitious practitioners who don’t know the context. “They don’t understand where they are and when projects fall apart it seems totally surreal,” he said. Tunkey has seen and heard it all over the years. 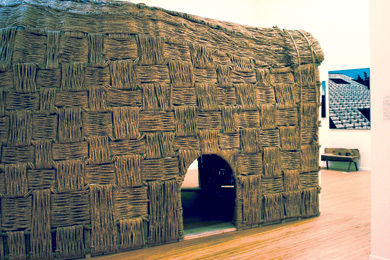 Foreign architects who lack on-the-ground experience maintain false assumptions and are quick to generalize. “I’ve heard people say they just assumed they would work for free. I always wonder, did they lose their minds on the flight over? Then they get burned and that’s their China,” he said. Riding the success of their collaboration on the Bird’s Nest stadium for the 2008 Beijing Olympics, Herzog & de Meuron and local artist-architect-dissident Ai Weiwei formed a partnership with developers to build 100 1,000-square-meter villas in a remote area of Inner Mongolia. They selected 100 architects from 27 countries (China was not included) to design unique villas as a way to attract more tourists. 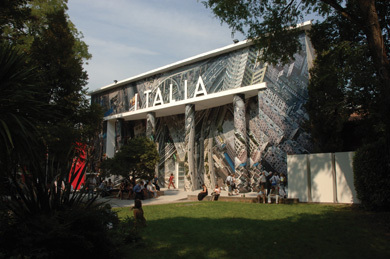 The list of architects involved included MOS, IwamottoScott, Preston Scott Cohen, and Toshiko Mori. 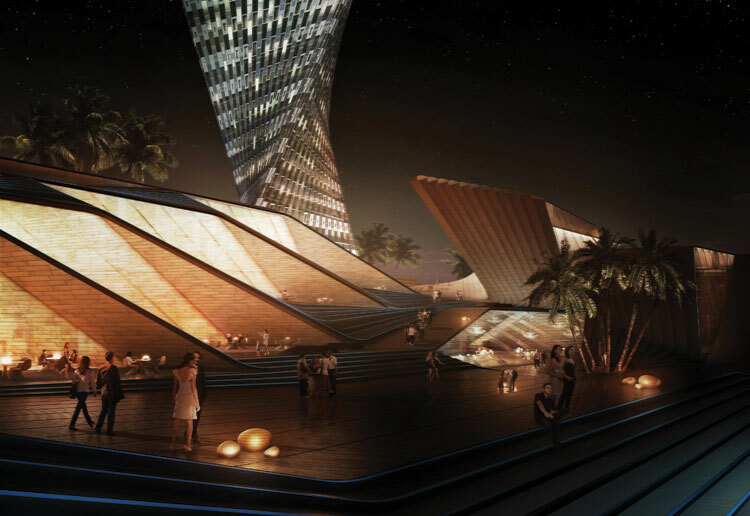 Synthesis’ unbuilt beach club in Xiamen. The film ends with the architects counting their money and then departing for their home countries with no clear understanding of what happened or what the future will hold. Not one of them has been back and there may never be any opening. Mehrdad Yazdani, who runs his own design studio as part of Cannon Design, is one of the lucky ones. 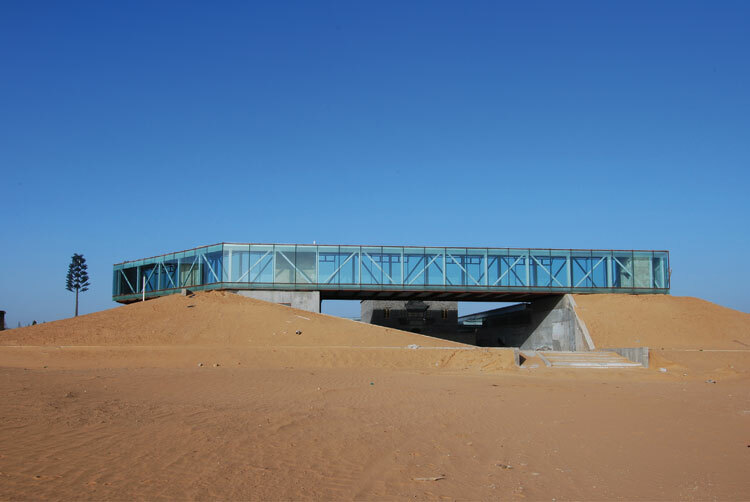 He has completed two of three planned projects, all in Ordos but outside of the Ordos 100. For Yazdani, the experience was about developing a method of working that goes beyond any one project. “We’ve reduced the unknown by tapping local talent,” he said. He mentioned how they even use Cannon’s China staff on U.S. projects. “We can work seamlessly, twenty-four hours a day,” he added. For both Yazdani and Cannon, China factors into a broader business strategy of outsourced labor and talent. Christopher Whitcomb, Cannon spokesman, describes this as their “SIFMO” methodology (Single International Firm, Multi-Office). 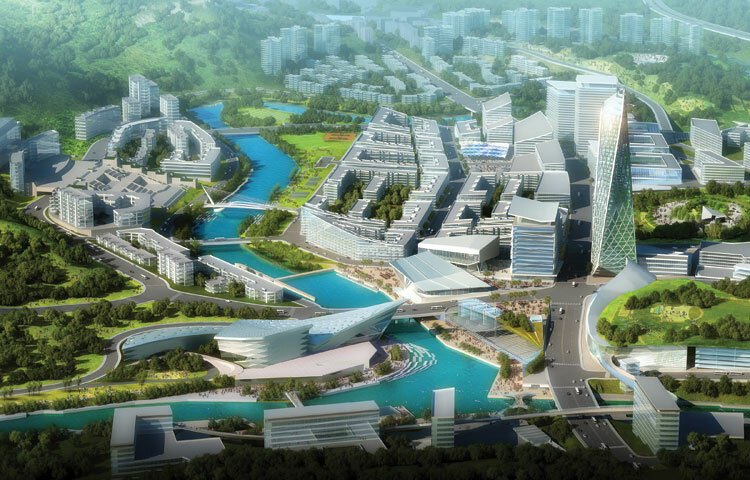 Johnson Fain’s master plan for Gulin, in western China. “Communication is hard enough when you’re brainstorming ideas in creative teams in one place rather than having it spread out all over the world. It just doesn’t work,” Rogers said. But while strategies may differ, one thing unites these firms: the recession made China even more important. Fain sees this continuing, but not forever. When asked if he thinks China will always need the expertise of U.S. firms, he describes how once clients would just say, “It’s great. Let’s do it.” Today, there is more questioning and more issues of local identity arise. Chinese clients are more critical. “They are learning our methods and it’s just a matter of time before they eclipse us,” he said. Chicago architects UrbanLab developed guidelines for the city of Aurora, Illinois, reprogramming landscapes with new soft-infrastructural networks. Tunnels, bridges, highways, and airports have traditionally been both the backbone of organized societies and the way they dig out of economic ruts and push on to higher standards of living. Yet events such as those at Heathrow have drawn attention to another, emerging infrastructure, one with none of the steel beams, soaring trusses, and hulking pipes we associate with the hard underpinnings that make cities work. This so-called soft infrastructure tends to be invisible or disembodied, organic in behavior, and powered by data networks, not engines. But when the world’s financial systems—soft infrastructure of an especially indecipherable kind—collapsed in 2009, the reverberations felt every bit as shocking as the collapse of a four-span suspension bridge. As with the disastrous opening day at Terminal 5, hard infrastructure—no matter how brilliantly designed— cannot triumph without effective soft infrastructure. All systems go? : Heathrow's Terminal 5, where hard and soft infrastructure meet in a confrontation between complex spaces and digital networks. The need to pay equal attention to both is fast becoming apparent across many professions, from education, healthcare, and government to architecture and urban design. Key areas of interest especially for designers include water management, layering social networks over transportation, and programming public spaces. In fact, finding ways to integrate soft solutions into building projects could be the opportunity that architects have been seeking to show how design thinking is an essential tool for building not only offices, schools, and museums, but also more smoothly functioning societies. Efforts to explore this largely uncharted territory are well underway. Last fall the Architectural League did so with its exhibition Toward the Sentient City, based on the premise that we “are now on the cusp of a fundamental reconfiguration of physical space, one in which a vast and mostly invisible layer of technology is being embedded into the world around us,” according to exhibitions director Gregory Wessner. Installations included LED sensors measuring and reporting on water quality in real time from the Bronx and East rivers, and mobilizing opportunities for office work in public places through social software. 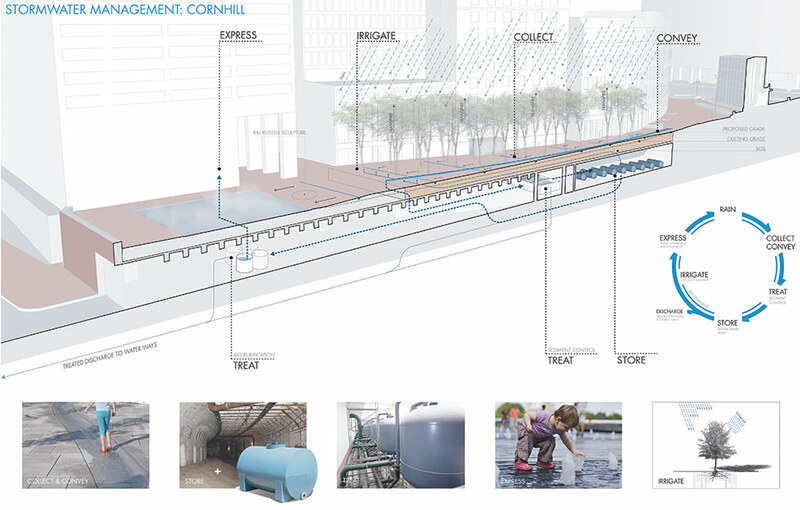 UrbanLab's Eco-Boulevard concept for Chicago would turn the city into a gigantic water recycling machine, using greenways to filter storm water. From the University of Pennsylvania, architect and landscape architect Anuradha Mathur, together with Dilip da Cunha, a planner and architect, have also been exploring new frameworks and modes of representation for ecological issues, from monsoons in India to Mississippi River floods. They are investigating historical maps and how the hard lines drawn to indicate solid divisions between land and water both misrepresent and prevent understanding—and appropriate response to—a landscape that in reality is in flux depending on the season, the climate, and agricultural uses. ”The time is past for measuring performance according to probabilities. Architects, engineers, and landscape designers need to build in resiliency,” said Mathur. 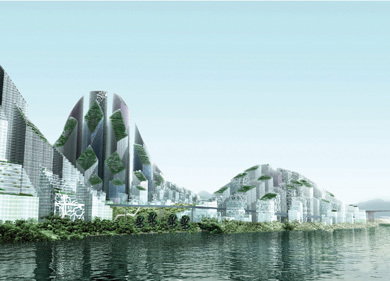 Closer to home, UrbanLab in Chicago has been concentrating on further developing a concept that architects Sarah Dunn and Mark Felsen proposed theoretically in 2006 when they won History Channel’s City of the Future competition in Chicago, a city where one billion gallons of fresh lake water are consumed each day. Functioning as a gigantic recycling machine, a citywide network of so-called eco-boulevards would treat all of Chicago’s wastewater—passing it along greenways and through vertical nodes, or living machines stocked with microorganisms, small invertebrates, scrubber fish, and plants—and returning it to Lake Michigan. As with SOAK, a key to the plan hinges on reprogramming existing hard infrastructure (around playing fields, parking lots, and airport runways) to double up as part of a flexible water-collecting network. Through swales, swamps, blue belts, and vegetation corridors instead of tunnels and pipes, water could thus be treated and absorbed back into the ecosystem rather than blocked and channeled out of sight as sewage. More recently, the architects have worked with Mayor Daley’s office to develop an “eco-boulevard toolbox,” including recommendations for improving ongoing and upcoming road renovations. 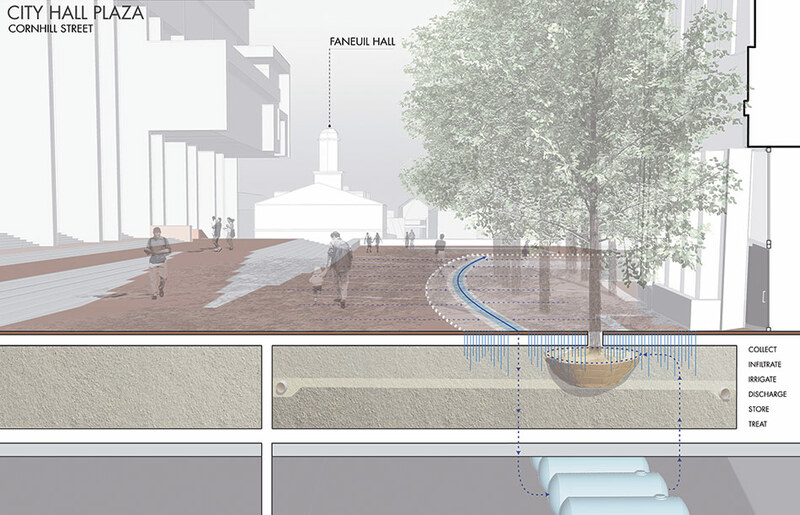 The ideas are robustly doable and include both point- and linear-based solutions for water absorption, including swales along median strips and planter boxes next to sewer points. Local Projects' BikeIt layers public infrastructure like bike lanes with an interactive network to create a super-charged iPhone app for cyclists. While much of the current thinking about soft infrastructure is focused on storm water, a second front is networking, especially as it applies to social and civic space. In a series of talks, and notably in a review of Sentient City on the Architectural League’s blog, the Sydney-based Arup designer and urbanist Dan Hill describes soft infrastructure as a way to “bend the physical city” and rescale it to what he calls “walkable urbanism.” Hill could have been referring to Bike It, an initiative by Jake Barton of Local Projects, a design firm focused on public space. Bike It takes advantage of underused infrastructure—in this case, New York’s bike lanes—by layering them with an interactive network. 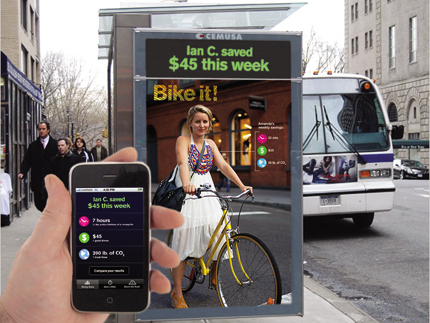 In brief, said Barton, Bike It is a “super-charged iPhone app that calculates time and money saved, as well as calories burned plus locations of other cyclists” that could be broadcast on LED panels already embedded in bus shelters around the city. Barton sees soft infrastructure as a powerful planning and advocacy tool that promises to change people’s behavior. And while Bike It could be a model for encouraging bicycle commuters, Barton realizes there is a cultural component to soft infrastructure that could thwart the best-laid plans: People don’t like to arrive at work in sweaty clothes. And so there is Cool Biz, a governmental initiative from Japan that recommends minimal air-conditioning at work and a greater tolerance for casual clothing. Intended to lower energy costs but equally focused on office culture, pilot programs are already in place in California and Colorado. Unintended consequences are a constant where soft infrastructure and humans meet. 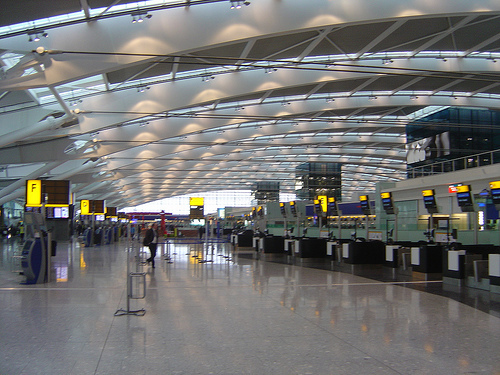 During a recent lecture for the New School’s Design and Social Science Committee Seminar—whose theme this year is “Infrastructure: Complexity, Risk, and Design”—McNeill of Sydney’s Urban Research Center described the collision of privatized interests, political will, digital interfaces, and human error at Heathrow, where hard and soft infrastructure are intimately entwined. Soaring spaces buttressed by structural derring-do may impress, but the real business of getting around depends on information in digital code, from e-tickets to LED announcement boards. The subtitle of McNeil’s paper is “The Heathrow Hassle,” and in it he detailed the Terminal 5 catastrophe to underscore the new reality that without complete integration, neither hard nor soft infrastructure is going to work. “The way we build has to be rethought, as the old ways don’t cut it,” said Hunt of Parsons’ TransDesign program. “The real opportunity for designers is to have a voice. We bring the right capabilities to this kind of problem.” And better understanding may offer the sturdiest bridge to get there. 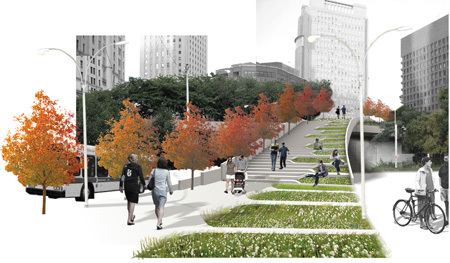 Weiss/Manfrediis concept design for Park Row introduces a landscaped, terraced pedestrain connection to the elevated Police Plaza. The mandate of the LMDC, formed by Governor George Pataki and Mayor Rudolph Giuliani in the aftermath of 9/11, was not only to oversee the rebuilding of the WTC site but to spearhead the comprehensive, integrated urban renewal of all of Lower Manhattan. To that end, it commissioned several major urban studies in areas below Canal Street by top-tier design firms, and encouraged them to truly think big-picture about rebuilding downtown. Weiss/ Manfredi, H3 Hardy Collaborative Architects, Robert A. M. Stern, and Smith-Miller + Hawkinson were all awarded contracts, amounting to over $2 million in fees, according to research compiled by AN at the time of these particular planss completion in 2004 (see World Trade Windfall,, AN 19_11.16.2004). When the LMDC announced last July that it would dissolve in the months to come, it maintained that its primary responsibilitiess selecting a masterplan and memorial design for the WTC site and allocating more than $2.78 billion in federal grants toward fostering business, residential, and cultural growth downtownnhad been fulfilled. Construction of the memorial and development of urban design guidelines for the site has been since delegated to the Port Authority of New York & New Jersey, but the fate of the urban studies the LMDC initiated has been more difficult to assess. The LMDC was never intended to be the agency that implemented such plans. Moreover, there is never a guarantee that any commission will translate into a realized work. But the fact that so little has been publicly discussed with respect to urban design at the WTC site or its surrounding neighborhoods since 9/11 merits a closer look at these plans, and at how or whether the ideas they propose might be expressed in built form. According to LMDC spokesperson John DeLibero, all of the above-mentioned plans have been transferred to the Department of City Planning (DCP). Rachaele Raynoff, DCP press secretary, confirmed that the DCP is in possession of them but could not specify how the plans are being prioritized. At present, the DCPPs biggest initiative in Lower Manhattan is the East River Waterfront Study by SHoP Architects and the Richard Rogers Partnership. One piece of news that gives reason to be optimistic that the plans wonnt end up in a drawer is Mayor Bloomberg and Governor Patakiis announcement in May 2005 of a comprehensive allocation plann for the LMDCCs unspent $800 million. The plan earmarked $110 million to implement certain elements of the LMDCCs urban plans, including the studies conducted by Weiss/ Manfredi, H3, and Stern. For some of the designers, the announcement was the last concrete news they received regarding their projects. Raynoff confirmed that the DCP, together with the Department of Transportation (DOT), is currently studying one aspect of Weiss/ Manfrediis larger plan, which looked at the area surrounding the Brooklyn Bridge Anchorage (see A View from the Bridge,, AN 10_6.08.2005). 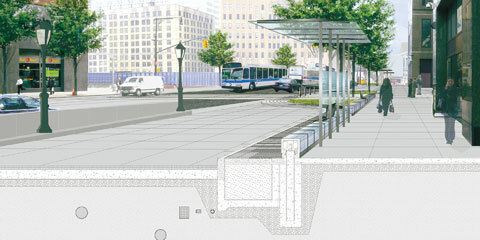 The plan envisions connecting Chinatown to the seaport through streetscaping, and makes specific recommendations for reinvigorating the closed-off area under the Brooklyn Bridge and replacing the concrete retaining wall behind Police Plaza on Park Row with a grassy, stepped pedestrian path to connect the elevated plaza with the street. After the architects presented the plan to the LMDC in 2005, the LMDC and other consulting city agencies focused on their recommendations for Park Row as a feasible project. Shortly after, as part of Mayor Bloomberg and Governor Patakiis allocation plan, $32 million was granted to fund components of their study and a related Chinatown study, including Park Row. As of yet, however, the DCP and DOT have not announced any concrete plans or schedule for the project. 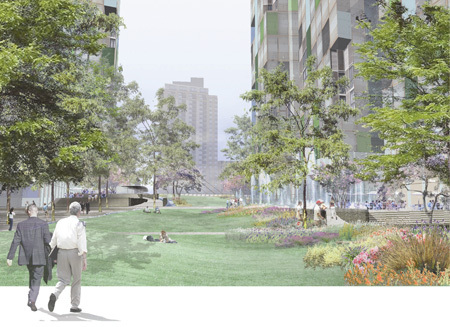 H33s design for Greenwich Street South proposed roofing over the entrance to the Brooklyn Battery Tunnel to create a park along with new residential and commerical space. Aspects of the Greenwich Street South Study, developed by a team of seven design and consulting firms headed by H3 Hardy Collaborative Architects, also appear to have a promising future. This study proposes decking over the existing entry to the Brooklyn Battery Tunnel (owned by the MTA), which currently separates Battery Park City South from the financial district south of the WTC site. The plan suggests that the new surface area of the deck would create valuable buildable space in an area where opportunities for largescale development no longer exist. In that new space, it recommends the creation of a 2-acre park surrounded by residential and commercial developments, as well as a bus garage south of Morris Street that would decrease current street-level congestion and house buses that might be displaced by potential developments on the East River Waterfront and Pier 40. At H33s last meeting with the LMDC in September, attending city officials agreed that if the engineering required to build the deck could be coordinated, the MTA would revisit the proposals. The DCP anticipates working with the Governor Eliot Spitzerrs administration to realize this plan. Though the prospects for the plan seem positive, principal designer Hugh Hardy still worried, With the fading of the LMDC, [the plan] doesnnt have a champion.. Senior associate John Fontillas added, The unfortunate thing is that [the LMDCCs former vice president of planning and development] Alex Garvin intended for all of these parts to knit together. With personnel changing, therees little institutional memory.. Though the designers have not received any updates on the status of the plan, it has been allotted $40 million under the 2005 Bloomberg-Pataki initiative. By comparison, aspects of Sternns Fulton Street Revitalization seem to be moving forward. With $38 million (again, part of Bloomberg and Patakiis 2005 initiative) approved by the LMDC board of directors in February 2006, the parts of the plan that have been retained for implementation, according to the DCP, include: enhancing the 35,000-square-foot Titanic Memorial Park and Pearl Street Playground, both set for completion in 2008; improving retail, facades, and streetscape elements along Fulton toward the East River; and creating a new open space at corner of Fulton and Gold streets. It is difficult to know, however, how close these elements are to the original design recommendations of Stern and partner on the study, Gensler. A public presentation of the study in 2005 was cancelled at the last minute, and even then, the plan was reportedly only in draft form (see Fulton Street Plan Chugs Along,, AN 12_7.13.05). 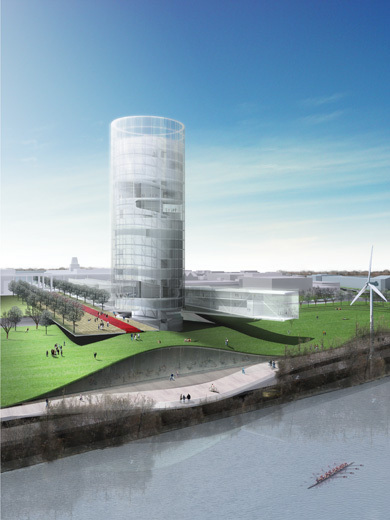 Moreover, both then and now, the designers have declined to comment, barred by the LMDC from speaking about the plan. Louise Nevelson Plaza is the result of a larger study by Smith-Miller + Hawkinson Architects to identify open-space possibilities in the blocks east of the WTC site. View west toward William Street. The most tangible results from any of the studies are from Smith-Miller + Hawkinsonns comprehensive urban study Strategic Open Space: Public Realm Improvement Strategy for Lower Manhattan. 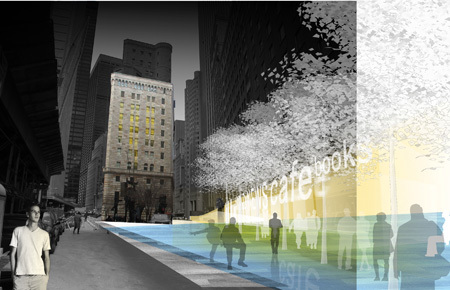 The study, which won a P/A Award in 2003, canvassed 500 acres of Lower Manhattan in the area roughly bound by Fulton, Church, and Water streets to identify possibilities for creating new public spaces and bolstering existing ones. 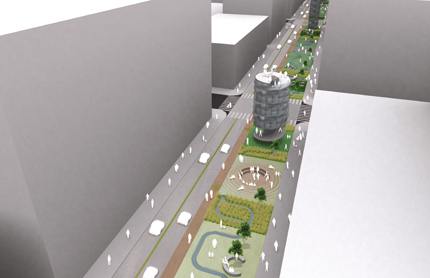 One site, Louise Nevelson Plaza, a run-down traffic island at the corner of William and Liberty, stood out as a feasible location to move forward on right away. The architects worked with the LMDC and other consulting city agencies to draft construction documents, and had successfully gone through the majority of the approval process well before the LMDC began to phase out. Since the LMDCCs dissolution, the Department of Design and Construction has taken over execution of the project, and has folded it in among its general infrastructure improvements on Liberty Street. The design for the plaza involves a series of changes meant to create, in principal Laurie Hawkinsonns words, a 24/7 open spacee in an emerging mixed-use neighborhood. The park will feature benches of cast glass, new lighting and planting, and seven restored Nevelson sculptures that the artist herself donated to the park in the 1970s. The project will break ground this summer, and is expected to be completed in 2009. The LMDC has never been forthcoming about its undertakings, despite the fact that these compelling urban design studies are nothing to hide. Even now, no one from the LMDCC including Kevin Rampe, chair of the LMDC boarddwill comment on the planss respective fates. The arrival of Governor Spitzer, who has been critical of the way the LMDC has been operating, may bring a change in direction. A. J. Carter, spokesperson for Empire State Development Corporation, the LMDCCs parent body, offered, We are taking a fresh look at everything and re-evaluating whatts been done and what needs to be done as we get started with the [Spitzer] Administration..
SAMANTHA TOPOL IS AN EDITOR AT AN. Rogers Marvel shows that security design needn't be defensive and formidable. With a holistic design approach, they prove that that there's more to safe streets than bollards and bomb dogs. Sara Moss reports. Addressing post-9/11 security requirements is now a central part of designing any major urban project. The obvious, and disheartening, reflex is to beef things uppto thicken walls, install barriers, widen distancessa trend most visibly seen in the redesigned Freedom Tower. But building fortresses and barricading streets aren't the only solutions. In two recent projects, Rogers Marvel Architects (RMA) has shown that safety can be integrated in subtle, multidimensional, and even beautiful ways. A core of collapsible concrete in front of the bench prevents heavily loaded vehicles get too close to the World Financial Center. 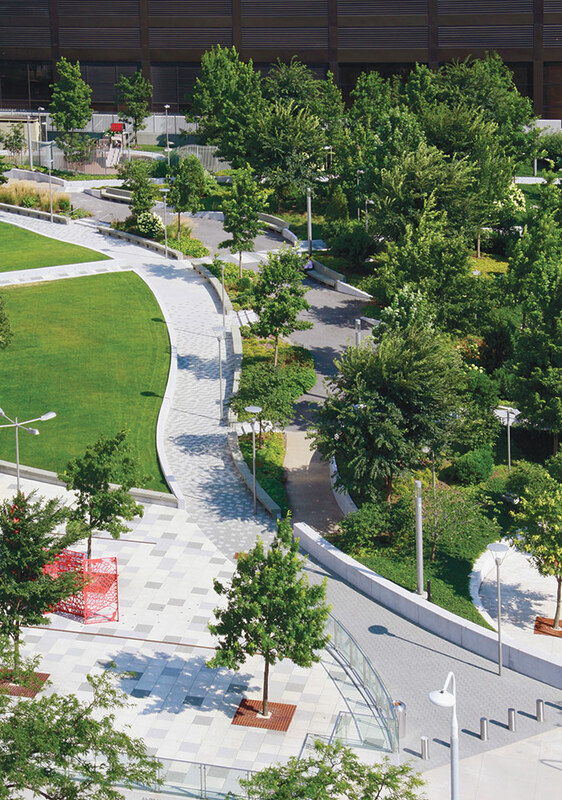 Addressing how Battery Park City meets its surrounding neighborhood, the designers found themselves deep in solving urban design problems that required large-scale decisions. Improving vehicular and pedestrian trafficcwhich would lessen potential threatsswas a paramount concern. With Schwartz, RMA devised a plan that called for adding raised crosswalks on North End Avenue (between 6 and 8 inches high, they make the street level with the curb). Further down the North End Avenue at Murray Street, they added neck-downss (curb extensions at intersections to slow down vehicles) to eliminate long, unimpeded approaches to Battery Park properties. These keep cars from picking up too much speed as they near the area. They also added truck and taxi lay-bys, areas where the vehicles could wait while separated from the street by barriers. Even the sidewalks assumed protective powers in Rogers Marvel's scheme. RMA used the existing cobblestone band that surrounds much of the World Financial Center to install a special collapsible fillla kind of concrete that's ordinarily used at the end of airport runways. The fill is sturdy enough for pedestrians but is designed to give under the weight of anything heavy, like a truck bomb. The firm sought advice from the Army Corps of Engineers on the urban use of the material and eventually entered into an agreement to share their research. So many architectural projects start out with form but this is real science,, enthused Marvel. It feels great to be working on this level..
At night, LEDs illuminate the benches and shelters. 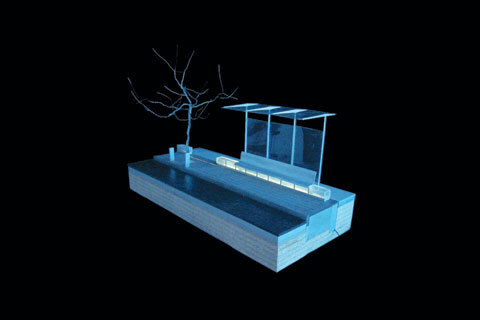 RMA also infused security qualitiessand hence multifunctionalityyin other elements, like cast-glass and stainless steel benches that are both furniture and illumination. Working with James Carpenter, the bench is luminescent depending on the angle of the sun; at night, it is lit by LEDs. The benches form an axis a quarter-mile long, from the site of the future Ferry Terminal to the World Trade Center site. The elements on the other axis, along North End Avenue, are lightweight stainless steel and structural glass shade structures that are lit from below, also designed with Carpenter. Interlayers in the glass bounce the light back down at night so that light pollution is minimized. One structure provides a shelter at the new dog run; another provides a structure for security workers checking trucks in the street. After presenting their Battery Park City work to city agencies, RMA asked to consult for designing security for the New York Stock Exchange, which led to a larger projecttNew York Financial District Streetscapes + Security, started in 2003. There, RMA were presented with a very different situation: a landmarked district with many clients (the DCP, LMDC, and EDC) and stakeholders (the New York Stock Exchange, Alliance for Downtown New York, and Bank of New York))all with serious concerns about safety. A fountain in front of the New York Stock Exchange (top) which would separate NYSE employees with security clearance from pedestrians. Many of the streets in Lower Manhattan have been closed off since 9/11, creating traffic nightmares and logistical headaches for businesses. At the Wall Street intersections, RMA used retractable bollardssa sort of trap-door system that will allow bollards to drop below street grade. However, at Broad Street, tangles of utility lines below the street made this solution nearly impossible (and prohibitively expensive). RMA needed a solution that could be installed quickly and sit within a shallow depth. As in Battery Park City, RMA found their solution on the ground plane. Working again with security experts Ducibella Venter & Santore, and with Quennell Rothschild & Partners (landscape architect) and Philip Habib & Associates (traffic engineering), they came up with a rotating disc that sits level with the ground. With bollards lined up across it, the 20-inch deep disc rotates to allow vehicles to pass by when necessary. 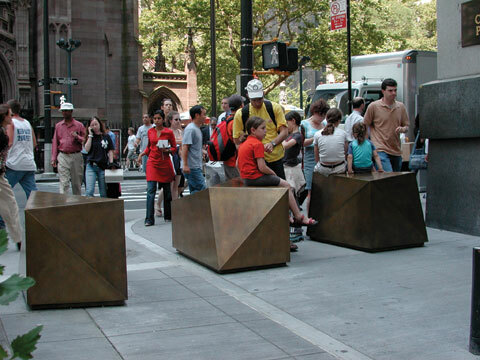 In a nod to some of the surrounding historic buildings' heavy old doors, the faceted bollards (which are in MoMA's Safe show) are made of bronze. RMA patented the crash-test rated turntables. This patent, along with ones for other RMA designs, will be handled by the office's newest spin-off, Rock Twelve, a division for research and patenting of security architecture. Rock Twelve will share resources with TRUCK, RMA's product architecture division. These other divisions permit development of side projects while keeping the firm's main focus on architecture, landscape architecture, and urban design. Rogers stresses that in the end, he and his colleagues are architects, not security experts. Their holistic approach, however, is proving to be popularrboth the Battery Park City and Financial District projects have won numerous awards in the past year. Rogers Marvel has taken the sting out of security measures in the Financial District with bronze bollards that double as benches on Wall Street. And both are being used as demonstration projects for the development of new FEMA security guidelines. And the firm was recently invited to work on a pedestrian open space project for the Department of Defense in Washington, D.C. We have no ambition to be security guys,, said Rogers, but what we like to do is to be incredibly inventive and solve problems. That's what good architects do..
Sara Moss works on the Fulton Street Transit Center project.